Previous research has shown that the percentage of children ages three and four reported by the CPS as being in “nursery school” or “preschool” is similar to the percentage of children reported by the NHES as participating in “center-based care”, which might include day care centers, preschools, prekindergarten, or (Early) Head Start programs. However, it is important to note that survey respondents may not interpret these terms as equivalent. For example, some respondents in the CPS sample may have children in “center-based care” that they would not consider to be “preschool”. These respondents would respond “no” to the CPS item asking whether they have a child in “nursery school” or “preschool”, but “yes” to the NHES item asking whether they have a child in “center-based care”. In the CPS, parents report whether their children attend “public or private school.” In the NHES, parents report whether there is “any charge or fee for this [early care and education] program, paid either by you or some other person or agency.” Although “public” could be thought of as not having a charge or fee (as with Head Start and most state prekindergarten programs located at public schools) and “private” could be thought of as having a charge or fee, the two sets of terms do not always align. For example, local preschools may be “public,” but still require a small fee. Likewise, a private preschool may accept subsidy dollars or other sources of public funding, and some parents may have no or small out-of-pocket co-payments. Therefore, throughout the rest of this section, we preserve the use of “public” and “private” to describe findings from the CPS data and “with payment” and “without payment” to describe findings from the NHES data, recognizing that these terms refer to categories of care that overlap but are not identical. 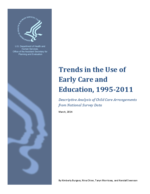 Center-based care and preschool: To be consistent with language used in the original surveys, this report uses the term “preschool” when describing data collected from the CPS and uses the term “center-based care” when describing data from the NHES. Non-center care: For consistency in aggregating, this report uses “non-center care” to include all non-parental care arrangements that are not in a center or preschool setting. This is most often home-based care arrangements with relative and non-relative providers. Infants and toddlers: Children under age three. Preschoolers: Children ages three and four. Poor families: Families with incomes below 100 percent of the Federal Poverty Level (which varies based on family size, and is updated each year). In 2011, the poverty level for a family of four was $23,021. Low-income families: Families with incomes below 200 percent of the Federal Poverty Level. In 2011, this represented $46,042 for a family of four. Higher-income families: Families with incomes above 200 percent of the Federal Poverty Level.